While the weather has still been bad I've not been able to blog much, but I have been posting instagram ootds if you fancy following me there (@94lauren_wilson). I managed to get these few photos just before it started raining today and although it was windy it was still pretty warm so I wore my new River Island shorts. They have a bright paisley kind of pattern that reminds me of a folk print which is going to be big this Summer! The shorts are so comfy and a bit more appropriate than some as I feel nicely covered up. Hopefully, the shorts will go with lots of things as there are so many colours within the print but for £20 I thought they seemed really good quality. I teamed them with my Primark jumper and holographic snakeskin sandals, which I am loving! They're comfy and give me a bit of much needed height, and they go with everything. After sitting on my last pair of sunglasses I had to go buy another pair and picked up a could in New Look as they were only £5 each! 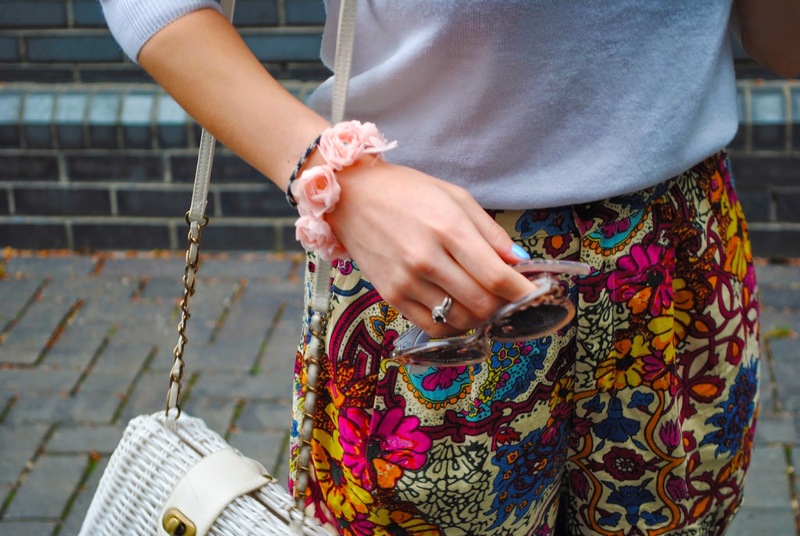 I could't resist adding my cute little Primark flower band, which I bought for the Summer when I wear buns but I like it as an extra accessory. What trends are you excited for this Summer?